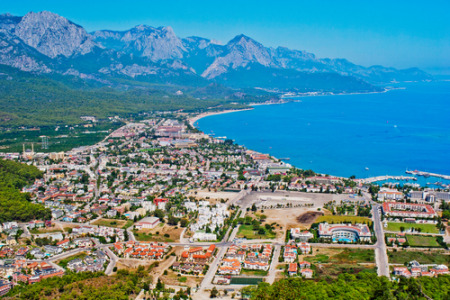 Kemer holidays offer relaxation in stunning natural surroundings. With a backdrop of the pine-clad Taurus Mountains and a brilliant blue bay opening into the Mediterranean, this recently developed resort offers every modern amenity. Holidays to Kemer are very popular with families and couples of all ages. Although there are some lively bars and discos, young singles would probably find nightlife a little low key. Holidays in Kemer can be taken from early spring until late autumn, with temperatures rising to the mid thirties at the height of the summer. Visitors have a choice of beaches, one is sand and shingle and the other pebbly. A range of water sports are available from the former. Those looking for an early spring break or wish for a guarantee of summer sunshine, may find our cheap Kemer holidays tempting. With first class accommodation, restaurants catering for all tastes our low cost Kemer holidays offer great value. Bargains such as these disappear like hot cakes so to avoid disappointment, take a look at our Kemer holiday deals today. For further information and to find our latest Kemer holiday offers, please use the search facility.